Why am I sharing this story with you? Because I am once again posting a rich decadent recipe that would be served at the finest of French Bistros – Balsamic Braised Beef Short Ribs. I can’t help myself, its winter here and there is nothing more comforting to me than the aroma of braising meat, rich with seasoning wafting from the oven. To the novice consumer of beef ribs it is easy to become confused with what you find at an average market. 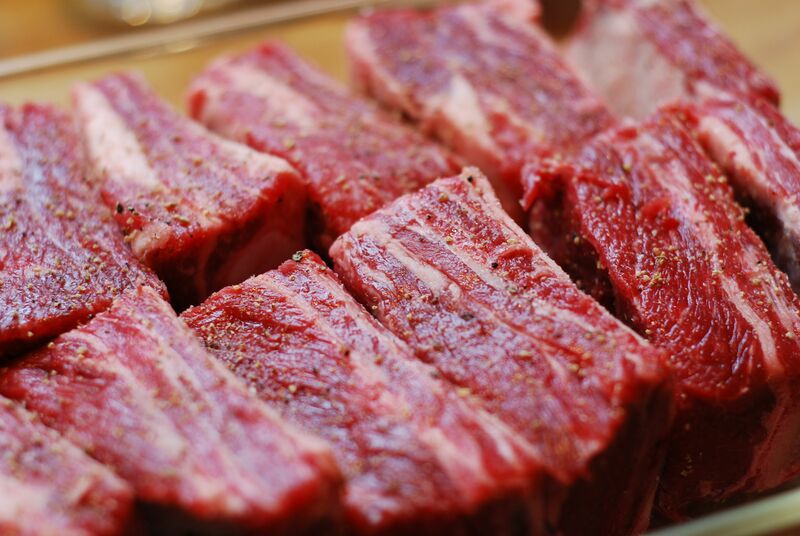 Many stores will label all beef rib cuts “Beef Ribs” but there are distinct differences between the ribs carved from the upper portion vs. the lower portion. For example, the Back Rib, which runs along the side of the Ribeye Steak are usually carved 6 to 8-inches long and have very little meat except what is found between the bones. But the cut we’re interested in for braising is the Short Rib, which is generally 3 to 5-inches in length and has a nice thick marbled piece of meat along one side of the bone. Short Ribs run along the Flank Steak and Brisket. For this recipe, select ribs that have a nice size chunk of meat on one side of the bone (1-2 inches of meat). They should also be nicely marbled but not overly fatty. When I first started cooking with wine I would buy cheap “cooking wine” that you find on the same shelf as vinegar in the grocery store. I didn’t need to be of legal drinking age as it wasn’t real wine to begin with. When cooking with wine, select one that you would enjoy sipping with your meal. The flavor of the wine will carry through to the final product so you could make the recipe exactly the same way but use two different wines and end up with two very different results. The same holds true with Balsamic Vinegar. If the vinegar you use in this recipe is very tart and acidic the flavor will carry through. If the vinegar is very sweet or mild flavored, the wine and beef will dominate the taste, which defeats the purpose of using Balsamic Vinegar in the first place. Salt and pepper short ribs. Heat olive oil in Dutch Oven or heavy stove-to-oven-safe pan. Be careful not to over-heat, as olive oil will burn at a lower temperature than regular vegetable oil. Sear the shanks until nicely browned. Sprinkle ribs with turbinado sugar. Let ribs sit in pan 1-3 more minutes to let sugar melt into meat. Transfer ribs to a platter. Preheat oven to 325°. If there is a lot of oil in the pan remove some, leaving about 2-3 Tbls. 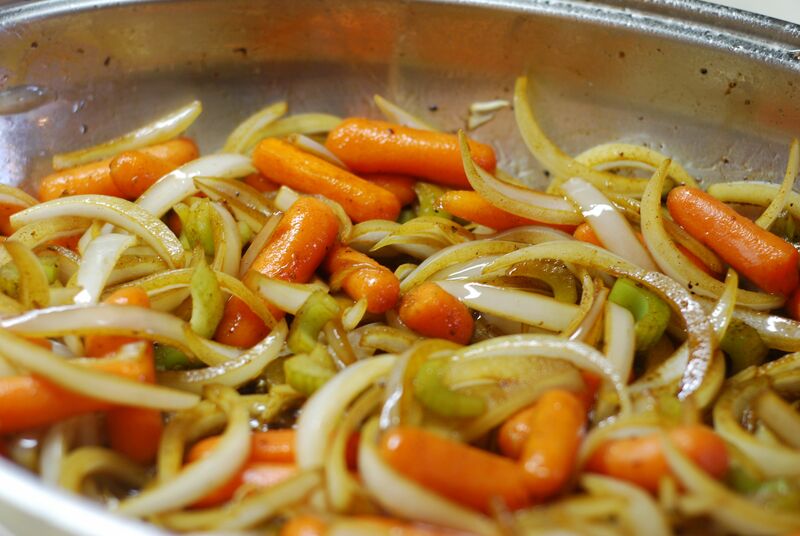 Add carrots, celery, and garlic. Sauté until veggies are lightly golden and glazed. At this point the skins on the garlic should pop off. Remove and discard the garlic skins. Return ribs to pan. Pour Balsamic vinegar over ribs, being sure to drizzle a little onto each rib. Let vinegar boil lightly in pan for about 3 minutes until the pungent scent of vinegar dissipates. Add wine and broth. Sprinkle rosemary, thyme, and bay leaves on top. When mixture comes to a full boil, cover and put into oven. Braise ribs in oven for 2 hours (NOTE: this is just a checking point, ribs will need to braised another hour). In a sauté pan melt butter, than add mushrooms and sauté for 3-5 minutes. Add mushrooms to ribs. At this time add 1-2 cups more beef broth (amount of liquid will depending on how much sauce you would like for the final product). Continue to cook in oven for another hour. Total time in the oven is 3 hours. Remove ribs from oven and skim off some of the oil from the pan. SERVING RECOMMENDATIONS: Serve over egg noodles* or with mashed potatoes. The ribs have a nice robust flavor so this dish generally goes best with a bland starch accompaniment. I made this recipe along with the pear salad (also posted on this site under Three Rose Marinade)and it was an absolute hit with my guests and my own family(both adults and children) . I made 7 lbs of ribs and increased the amount of the ingredients accordingly. Thank you. So happy that this recipe was a success for you. Thanks for sharing your results. 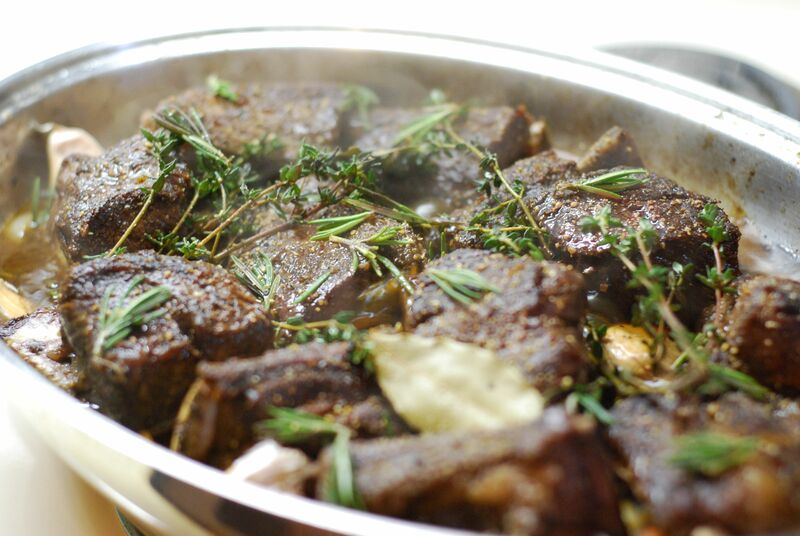 You are currently reading Balsamic Braised Beef Short Ribs at Hestina's Kardia.